A Tuskegee University veterinary student accused of promising to love and care for re-homed horses and instead selling them to slaughterhouses was arrested at a weekend rodeo in Blount County. Fallon Danielle Blackwood, a 24-year-old Boaz woman, was taken into custody by deputies on a 13-count indictment charging her with bringing into the state property obtained by false pretense elsewhere. The indictment was issued in October 2018 and marked the second state to bring charges against the woman. She was also arrested at the vet school in Macon County eight months ago on an outstanding North Carolina warrant on similar charges. Blackwood has been released from the Blount County Jail after posting $15,000 bond. She’s returned to vet school. Blackwood on Tuesday declined comment and court records do not yet list an attorney for her. A call to Tuskegee University officials for comment was not returned. Rosentrater and her husband in January 2018 found they were expecting a child and were not in a solid financial position to care for their aging horse, Willie. The horse was almost 15 years old and suffered from ailments that prevented him from being ridden. Additionally, the farm where Willie was being kept was going through a transition and all of the boarded horses had to be out by the end of the month. The two women spoke by phone and arranged for Blackwood to travel to Georgia to meet Willie. That introduction took place on a cold, rainy Sunday, Jan. 28, 2018, at a Cherokee County, Ga. barn. Blackwood showed up with a truck and horse trailer. Blackwood saw the Facebook Page and pleaded with Rosentrater to take it down, she said. There was back-and-forth conversation between the two, with Blackwood claiming she had given Willie to a family for their young children. Eventually, all communication ceased. On April 3, Blackwood was arrested after Alabama’s State Bureau of Investigation notified the Tuskegee University Police Department that a warrant had been issued for Blackwood’s arrest by authorities in North Carolina. That warrant claimed that Blackwood obtained property — specifically, two horses — under false pretense, and included a request for full extradition. She was taken into custody on campus and transferred to the Macon County Jail where she was held on the charges for North Carolina’s Martin County Sheriff’s Office. On April 6, Rosentrater posted on Facebook that via Missing Horse Report filings through NetPosse.com, also known as Stolen Horses International, they had found 26 horse owner victims and 39 reported horses. “These numbers are rapidly growing as we have had recent exposure in the media,’’ she wrote. On Tuesday, Rosentrater said they have identified almost 50 missing horse reports from six states filed with Netposse.com that are linked to Blackwood. Macon County Sheriff Andre Brunson said he wasn’t aware of Blackwood’s latest arrest in Blount County, but said it is a sad, tragic case if all the allegations against Blackwood turn out to be true. “These people trusted that their horses were being taken care of and instead they may have gone to slaughterhouses,’’ he said. 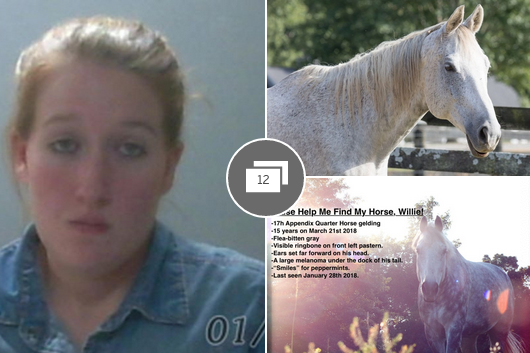 Just 13 days away from the one-year anniversary of turning Willie over to Blackwood, Rosentrater said she still has not found out for sure the fate of the horse she had loved and cared for since she was in high school. “We have pretty strong indications he did get shipped into Mexico for slaughter,’’ she said. Right now, the price of meat is about 50 cents on the dollar, she said, which would have brought someone about $750 for the 1,500-pound Willie. “She had a four-horse trailer and it seems like in many of the cases, she was picking up more than one horse at once,’’ she said. Blount County District Attorney Pamela Casey said she was made aware of the case when the State Bureau of Investigation approached her late last year. “There has been a large number of persons across the southeast who provided information in this investigation, and we appreciate their help,” Casey said. Rosentrater said she’s thankful that Blackwood will now have to face the charges in an Alabama court but said she still has so many unanswered questions. “Why? Where?’’ she said. Do you know the federal government transports live horses to Japan for meat? The U.S. Forest Service has built a new corral for wild horses in Northern California, which could allow it to bypass federal restrictions and sell the animals for slaughter. Rob Jeffers and Missy Merril accepting the MCFB Distinguished Service Award for the Wild Horse Plan Working Group. She was also the organizational mind that conceived developing the Wild Horse Territory Plan through the Retired Worker Program and along with Rob Jeffers is responsible for its timely and efficient completion. This Plan was the essential first step in reducing the over population of wild horses. (November 20, 2018) On Saturday morning, I returned to the Double Devil Corrals in the Modoc National Forest near Alturas, CA for the sale/adoption of recently captured wild horses from the Devil’s Garden Wild Horse Territory. Seeing wild horses who weeks ago were living freely on our public lands now separated into pens from their band members – numbers spray painted on their backs to identify them and their age – was nothing short of heartbreaking. The predictable result of putting these inexperienced and uncaring people in charge was chaos, ineptitude, and trauma to horses as well as possible injuries. While being escorted by Susie Johnson, a Forest Service staff member, to look at older or special needs horses for possible placement into sanctuaries and rescues, we stopped at a pen with about 25-30 geldings. Lying near the front was a small chestnut, estimated to be around 20 years old, in a small group of horses. In fact, a few minutes earlier, Leigh Sevy, Forest Rangeland Management Specialist, had approached me and a member of the volunteer placement group that found homes for horses captured in the 2016 roundup and has been working to place the horses currently in the pens at the Double Devil Corrals. Ms. Sevy was interested in placing the senior gelding because she was worried that he was stressed from being beaten up the bigger and younger horses. Ironically, just after she left to make arrangements to move him into safer holding, two wranglers on horseback entered the pen to sort out a horse who was either sold or adopted. The plan was to separate him from the other horses and move him through an open gate at the far corner of the pen and into an aisle that lead to the loading area for trailering. When the wranglers began to push the horses to where the older horse was still lying, however, a few people outside the pen asked them to stop because they were concerned that the wranglers couldn’t see him and that he could get trampled. In the response, one wrangler dismounted and got the horse up. But after that, the chaos began. As the wranglers continued to move the horses around the pen, trying to get the adopted/sold horse into the aisle, the other horses began to stampede, circling around and around the tight space of the 60’ x 60’ pen. At least one horse fell while others ran into the aisle and charged back out, with many of them crashing into the gateposts. This continued for several minutes, with the wranglers never backing off their efforts to move the horses. Almost immediately after this conversation, Ms. Snell came rushing over from the loading area to the same Forest Service official, complaining that “members of the public” were interfering with the wranglers’ work! One of the people she was referring to was me – simply for observing and raising concerns about the safety of the wranglers’ actions. In the past 10 years, I’ve attended over 15 BLM wild horse and burro adoptions across the country where hundreds of horses and burros have been sorted and loaded into trailers. Never once have I seen such utter bedlam. Devil Corrals and was the lead in sorting and loading horses, assisted by her summer intern and several wranglers who also had no wild horse handling experience. Join the California Rangeland Conservation Coalition and University of California Agriculture and Natural Resources for the 2018 Rangeland Summit! California wild fire policy – What’s next? Will grazing be recognized as a tool? Among all this bad news, note that Willie had a large visible melanoma (and probably more internally) and this may have been knowingly introduced into the humand and pet food chain, untraceable. And we call ourselves sentient? 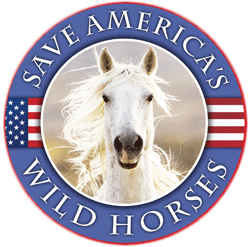 Devil’s Garden Wild Horse Emergency Rescue–SAVE the DG 300 from Slaughter! Please note, this Group page is for placing the older DG horses & not to discuss policy or politics. However, I must share this thought with all here: The end of the article places all the blame for rangeland damage on the DG wild horses. Why else would the Forest Service build a corral at Modoc to hold a portion of the rounded-up horses if the intent is not to bypass congressional appropriations restrictions on unlimited sale, notes a Jan. 8 motion filed by plaintiffs’ attorneys in support of the injunction request. Ethan Lane, chairman of the National Horse & Burro Rangeland Management Coalition, which advocates for downsizing herds on public lands to sustainable levels, supports unlimited sales. Good! If these monsters are capable of being shamed – who is the more sensitive of creatures, I wonder? Certainly not the human. This woman Fallon Blackwood should be barred from Vet school and not allowed to work with any animal, especially horses! She very obviously has some severe mental issues and is probably sociopathic. Disgusting! Hopefully she will be prosecuted to the full extent in this horrible travesty and will suffer as much as all of the devastated people (and their horses) have at her twisted cruelty. There is no excuse for this.